Sitting behind some large trees, between Newberg and Hillsboro is a farm-themed store that is as authentic as it is special. 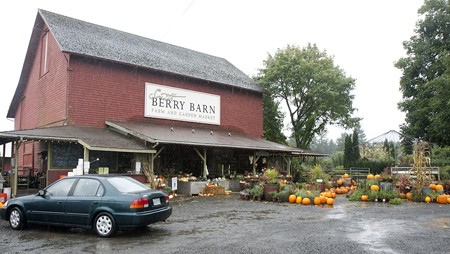 Smith Berry Barn Farm and Garden Market is the quintessential agri-tourism stop for those visiting Oregon. Washington County , while known for being the “silicon forest,” has a number of excellent family farms with stores, hay rides, tours and the like. Smith Berry Barn, however, feels less like a farm trying to be a retail outlet, and more like a family enterprise that wants to give people the best, local products possible. The market looks like a big red barn, and depending on the season, there are different types of produce, plants and other items out front and along the side in a covered area. That is one of the ingenious elements of the market, the front is covered, so during the nine months of the year where rain is a possibility, you can still enjoy the outdoor feel of the market. I visited during the harvest time, and frankly it’s my favorite time to visit stores like this one. Fresh apples, pumpkins and gourds make it feel like there is an explosion of fall colors. One of the first stops we made during the rainy afternoon was the side covered area which had all different types of gourds. My daughter and I spend probably 10 minutes looking at all the small ornamental gourds of different shapes and sizes we hadn’t seen before. Next to them were white pumpkins, something that fascinated my 9-year-old daughter, as we walked around to the front of the building, there were several bins of different varieties of apples, with samples sitting on top for people to try. The market is located on a 30-acre family farm, and during the different seasons, there are different items that you can u-pick. For example, when I visited there were u-pick tomatoes. In addition there were also many varieties of u-pick apples, including Akane, Gala, Jonagold, Jonathan, Liberty, McIntosh and pears including Asian pear and Bartlett. There are 5-acres of apples with more than 20 different varieties. This was all before we even entered the building, and what we found inside was as good as the outdoor aspect of the market. The inside of the market features the home décor items you would normally see in a farmer market, but there are also areas for local pure, raw honey, gift baskets, candles, soaps, and even kitchen utensils and tools. What I found the most impressive was the staff’s knowledge about all of these areas. Many of the products are local and are very high quality. There are European-inspired kitchen and bath products, as well as a nice library of books on everything from baking the perfect cupcake to making delicious entrees. If that wasn’t enough, in the back corner of the market is a section with antiques and until dishware and decorations. When we visited the Halloween decorations were front and center, and they had many very classy seasonal decorations that ranged from small metal spiders, to pieces that would look nice on any mantle to celebrate the season. The highlight for my daughter was the coffee bar, where they not only have coffee, but also fresh, hot apple cider and milkshakes made with fresh fruit. We ordered two fresh milkshakes and they were some of the best milkshakes we have ever had. With the fresh fruit and local ice cream, they were wonderful, even during a rainy September day. The staff also gives wonderful garden advice, and I figured out that I may not have the right location to try my hand at an apple tree, but at least now I know where to find some of the best local, fresh apples in the Yamhill Valley. About Smith Berry Barn Farm and Garden Market: What first began in 1978 as a u-pick raspberry farm, is now a 30-acre family farm and much more than just berries. We still specialize in over 10 varieties of cane berries, including red raspberry, golden raspberry, Marionberry, several varieties blackberries including boysenberry, loganberry and tayberries. We also tend to a 5-acre apple orchard, featuring over 20 varieties of antique and modern apples. In the remaining corners of our farm we grow a variety of specialty produce including gourmet greens, fresh herbs, gourmet squash & pumpkins and heirloom tomatoes & peppers. Our goal is to provide you with the freshest, highest quality produce in our local market. Our selection changes with the seasons and reflects the very best that the Willamette Valley has to offer. What to bring: If you plan on doing any of the u-pick activities, depending on the time of year, make sure you have the right clothing and shoes. In addition, if you are planning on buying produce or larger gourds, or decorative items, make sure you have the space and way to secure them so you don’t have pumpkins rolling around in the back of your car, sheering off stems, or breaking decorative items. Tip: Don’t miss a small room toward the back of the store that has several books and antiques available. It’s easy to miss if you don’t look for it and it’s worth the visit. In addition, give yourself plenty of time, because while other farmer’s markets do have stores, they don’t have the variety that Smith Berry Barn does. You could spend an easy 30 minutes wandering inside the store looking at all the unique items and ingredients. Season: The market is open year-round, check its website for specific hours and availability of produce. Getting there: The market is located at 24500 SW Scholls Ferry Road, Hillsboro, which is also called highway 210 from Newberg to Hillsboro.